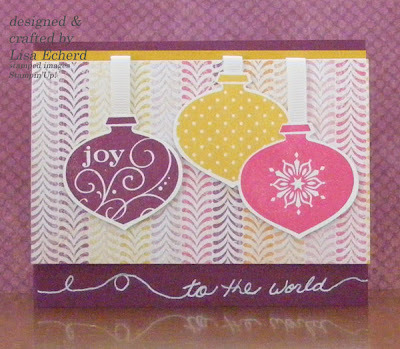 My friend Sharon loaned me her Delightful Decorations stamp set and the ornament punch, both from the Stampin' Up! Holiday Mini catalog. She wanted my take on these tools so this is what I came up with. I wanted to see what I could do with the In Colors for Christmas this year. We did this card yesterday in our stamp class. I think everyone was apprehensive, as I was the first time, about using the white gel pen and writing a sentiment. Writing first in pencil helps a lot. We learned that it is easier to go over the pencil writing with the gel pen if you keep your pencil pressure light. The gel pen doesn't drag as much. It is actually very easy and we were all pleased with our results. With these bright colors, I thought this made a good entry into this week's Pals Paper Arts challenge. Great job! I love your color choices and layout! Thanks for playing @ PPA!